Baiturrahman Grand Mosque is a Mosque located in the center of Banda Aceh city, Aceh Province, Indonesia. The Baiturrahman Grand Mosque is a symbol of religion, culture, spirit, strength, struggle and nationalism of the Acehnese people. The mosque was originally designed by the Dutch architect Gerrit Bruins. The design was subsequently adapted by L.P. Luijks, who also supervised the construction work done by contractor Lie A Sie. The design chosen is Mughal revival style, characterized by grand domes and minarets. The unique black domes are constructed from hard wood shingles combined as tiles. The interior is decorated with relieved wall and pillars, marble staircase and floor from China, stained-glass windows from Belgium, well-decorated wooden doors, and ornate bronze chandeliers. The building stones are from the Netherlands. At the time of its completion, this new design presented a stark contrast compared with the original mosque that many Acehnese refused to pray in the mosque, because it was built by the Dutch “infidels”. 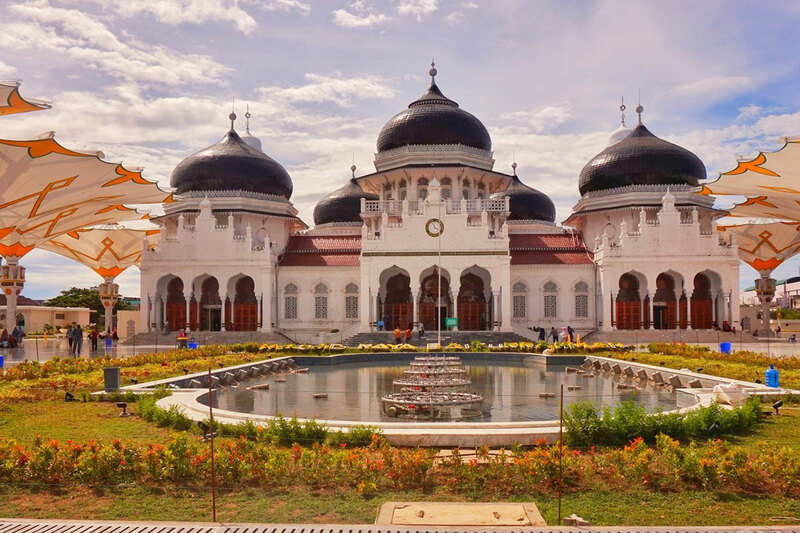 Today however, the mosque has become the pride of Banda Aceh. Short Description: Baiturrahman Grand Mosque is a Mosque located in the center of Banda Aceh city, Aceh Province, Indonesia. The Baiturrahman Grand Mosque is a symbol of religion, culture, spirit, strength, struggle and nationalism of the Acehnese people.